Lately every Sunday has been a crockpot day. The cookbooks I have been using say they are for slow cookers not crockpots. So, what's the difference between a crockpot and a slow cooker? According to Foodal.com: A true slow cooker consists of the same three components as a crockpot: glass lid, pot, and heating element. However, instead of the ceramic or porcelain pot of the crockpot, slow cookers generally have a metal pot. This means the two Teena and I own are crockpots! The recipes are for both. 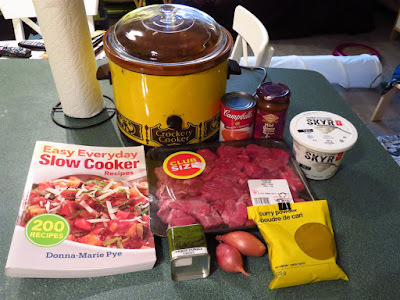 Today I'm making Madras Beef using a recipe from Donna-Marie Pye's Cookbook, Easy Everyday Slow Cooker Recipes. Finely dice the shallots. Then in a bowl combine the tomato soup, curry paste, curry powder and paprika. Set both aside. Then in a large fry pan, heat half the oil on medium high heat. It's best to cook the beef in smaller batches as if they are crowded together in the pan, they steam instead of saute. I did mine on two batches. Turn meat often so it cooks quicker. Spoon meat into the crockpot with a slotted spoon. Once the beef has all been cooked and added to the pot, saute the shallots in the remaining oil/juices and, once they are translucent, spoon over the beef. Pour the sauce mixture over the meat and stir in. Cook on low for 8 to 10 hours. Stir in the yogurt, turn off and let sit for 5 or 10 minutes. Spoon over rice. Madras Beef has a very earthy taste. It's comfort food with a little snap. I'm not sure if using Madras curry paste and garam masala spice would kick it up a notch or change the flavour profile. I do know Teena is quite happy that there is enough left for a couple lunches!